R Venkatesh's assistant was the guilty party when he did not give Chhetri offside in the match against Kerala Blasters. The Yellow Army were playing at home in Kochi and went on to lose the match 2-1. Miku gave Chhetri a through ball in the 17th minute of the match but the Bengaluru skipper was clearly offside. 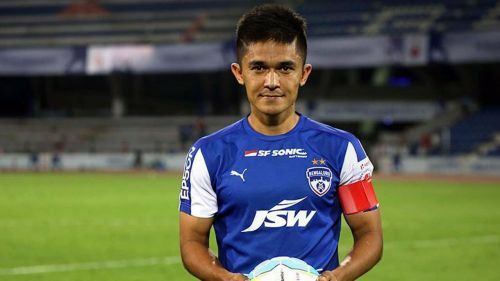 Chhetri slotted the ball home in the right corner past a hapless Naveen and the goal remained as no offside was given by the linesman. David James and Sandesh Jhinghan were expectedly miffed with the poor officiating. The English coach even went on to state in the post-match conference that VAR should be introduced in the ISL. The Manjappada have suffered a lot in this ISL due to referee gaffes. In another match against the Delhi Dynamos, CK Vineeth was fouled inside the box and it was a clear penalty but it wasn't awarded to them. Emiliano Alfaro had also handled the ball in their game against FC Pune City but the decision was not given in their favour.